Higher gas taxes could finance the high-speed rail system in California. On a flight from San Diego to San Francisco, I sat beside a woman who by coincidence was also returning from the August 1997 demonstration of automated highways. 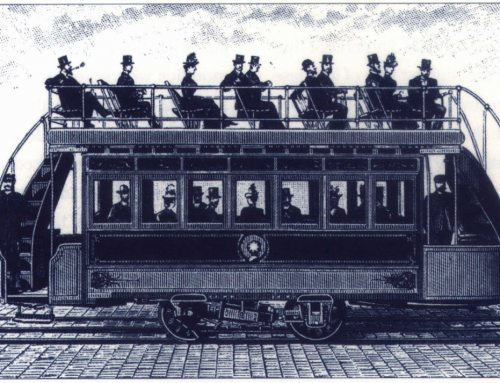 I expressed my enthusiasm for full automation to turn highway lanes into automated electronic railroads, with individual automobiles, akin to rail cars, hooked up electronically. Off the highway, these cars would revert back as individual automobiles to provide the ubiquitous local accessibility people expect from cars. The railroad analogy sparked the interest of my traveling companion, whom I’ll call Mary Smith. She wondered why we shouldn’t build a railroad instead, saying that automated highways would be costlier and would require higher subsidies. I noted that costs and subsidies are different issues, and that one mode’s higher costs do not necessarily mean higher subsidies. Subsidies occur only when costs are not fully internalized, that is, when they are not fully paid by users, but spread to society at large. Even if rail and automated highways were to cost the same to build, I said, rail would probably require larger subsidies. That’s because most of the additional electronics in automated highways would be vehicle-borne and hence directly paid for by auto owners. Indeed, I added, automating highways might result in lower subsidies to the overall system because it would be designed to lower the externalities of noise and air pollution. Even with today’s technologies, high-speed rail (HSR) is not only costlier than its competitors in the California Corridor – highway and air – it also would require larger subsidies, I said. But I was reluctant to enter into a debate about the wisdom of building a high-speed railroad in California. 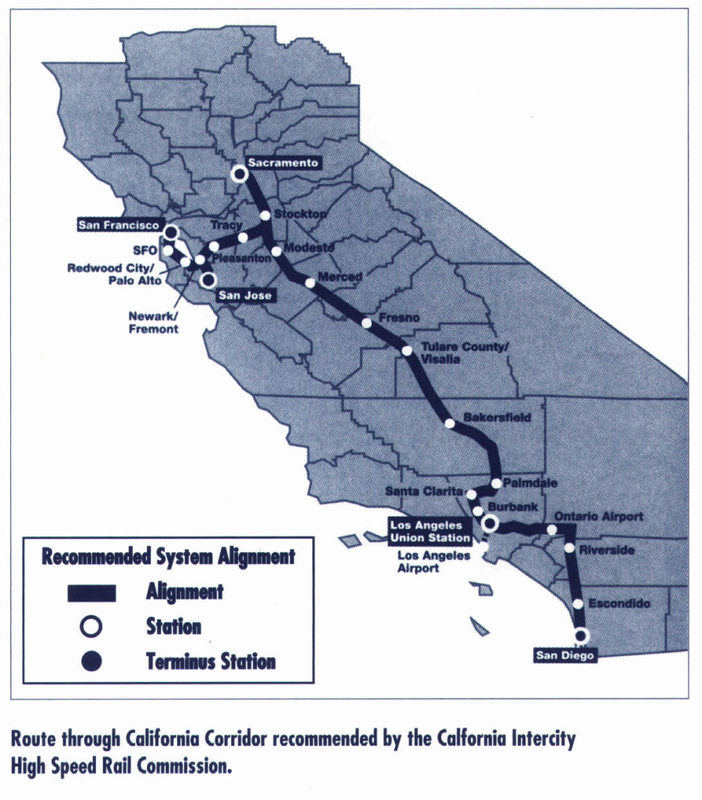 AK: Our research looked into the full costs of the three transportation modes in the California Corridor. 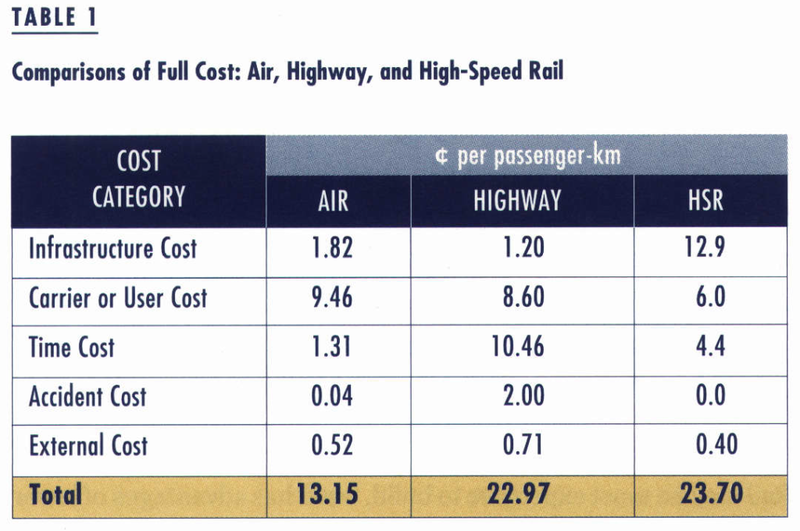 We estimated HSR’s at about 24¢ per passenger-kilometer, about the same as highway cost (23¢) , but nearly twice that of air (13¢). To put these numbers in the California context, consider that the full cost of a 500-km trip is $120 by rail, $115 by highway, and $65 by air. MS: Yes, but full costs include both internal and external costs. Rail may be most expensive to build, but it has advantages of lower external environmental costs. AK: Look at Table 1. Rail is the most expensive infrastructure to construct, all right – nearly ten times the cost of highway or air transport. Its operating costs, including money and time costs, are comparable to air, but nearly half those of highway, where slower speeds and congestion make time costs so high. We’ve also estimated the social costs of accidents, noise, and air pollution. Here, rail is the cheapest mode. Its noise costs are similar to the other modes’, but it generates negligible air pollution. MS: It’s also the safest mode. AK: You’re right! We assume zero accident cost for HSR, expecting a California system will be as safe as TGV and Shinkansen have been. As you can see, highways are by far the costliest in this category. But it’s debatable whether to count accidents as external costs, since they’re borne mostly by motorists. It’s true that incident- management and health-care costs are borne by society at large, but they’re difficult to disentangle. MS: Your table says highway and rail are comparable in full cost. So why not build rail instead of expanding the highway system? AK: The reason is the subsidies required by rail. We need to know which systems cover their costs, and which require public subsidies – and the question of whether subsidies are justified is another issue. MS: You say that rail requires higher subsidies. 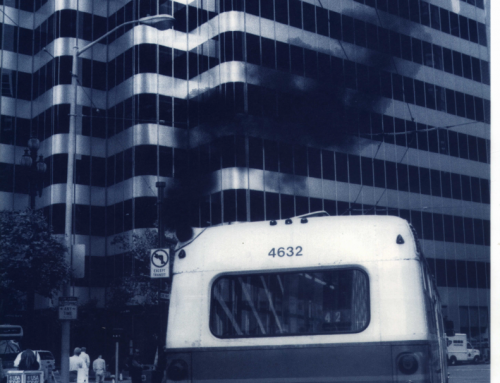 What can you tell me about the subsidies now enjoyed by air and highway users in California? How do these compare with the subsidies you project for rail? AK: To answer this question we constructed a balance sheet comparing public outlays with user-generated revenues. The difference represents a net surplus generated by the system and its users, or a subsidy received by them. External costs of noise and air pollution are public outlays in this balance sheet because they’re essentially borne by society. Our research found that none of the three systems pays for itself. 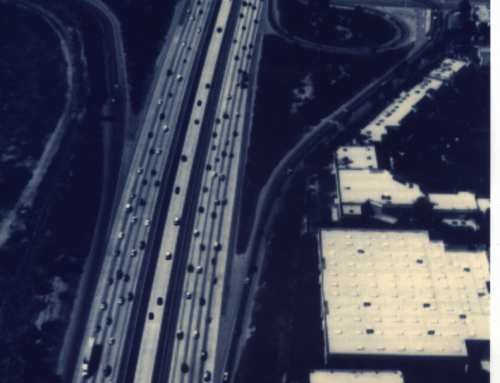 Air and highway cover their internal costs and pay only part of their social costs. Rail cannot cover even its internal costs. MS: In other words, air and highway are actually being subsidized by the public because they don’t cover the full cost of their noise and pollution. It would be useful to compare the balance sheets for each mode. AK: We did that, conducting a different accounting for each of the modes, fitted to the way each is financed. 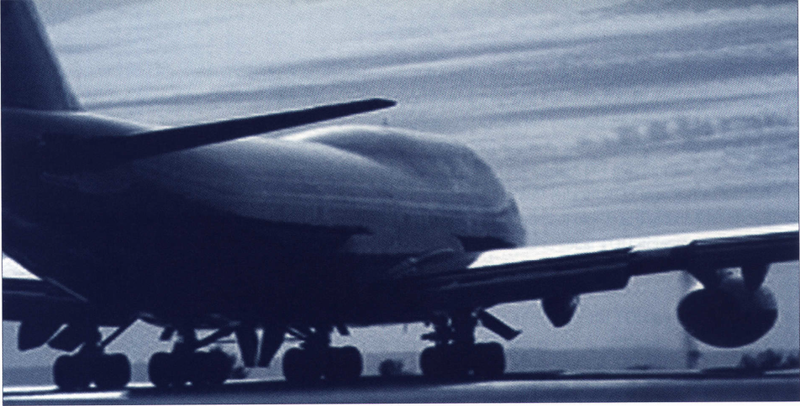 For air transportation we considered the following outlays: airport development grants from the Aviation Trust Fund, local airport expenses for operations and maintenance, and locally funded development. 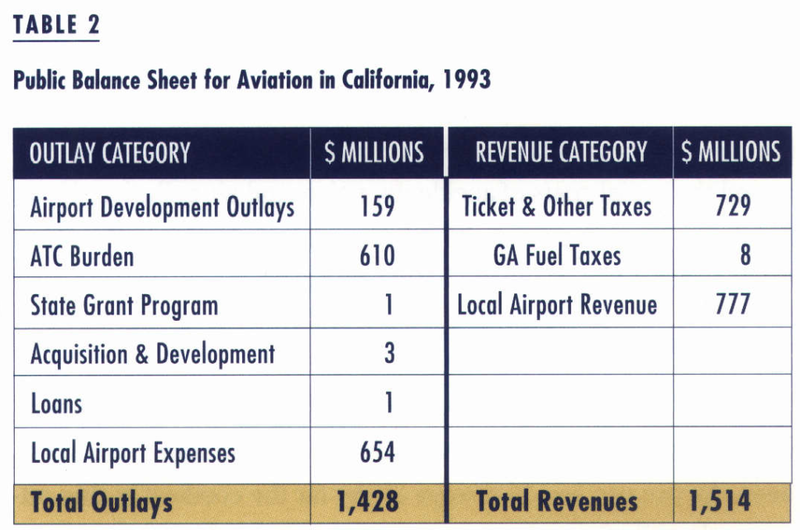 We also considered the cost of air-traffic control (ATC) services, by allocating the costs of these services to flights on the basis of the amount of flight activity generated in California. MS: What about revenues generated by the airport system? AK: These are ticket and freight-waybill taxes paid directly to the Trust Fund; general aviation fuel taxes that go to the state; and local airport revenues paid back to local governments. The balance of these revenues and outlays is shown in Table 2. MS: Your figure shows that the revenues exceed the costs for a surplus of about $86 million. So the airport system is more than paying for itself. AK: That’s because Table 2 doesn’t include the external costs of noise and air pollution. These are estimated from Table 1 and total $389 million for California. The balance sheet changes, and the air transport system in California ends up $303 million in the red. That translates to a subsidy of 0.4¢ per passenger-km. The results are summarized in Figure 1. MS: So, when considering social costs, the air system is being subsidized – the costs of noise and pollution aren’t recovered from the users. MS: How can we then fully recover these costs? AK: The subsidy according to our calculations is 0.4¢ per passenger-km. This could be recovered by a ticket surcharge on the order of $2.25 for a typical California Corridor air trip. It’s easy to assume that such a surcharge will not appreciably affect the demand for air trips, which means that air transportation system in California can be made to fully cover its costs. MS: Does this mean we’re each receiving a $2.25 subsidy from taxpayers for this flight to San Francisco? MS: What about highways? Taxpayers must be subsidizing them heavily. AK: The outlay and revenue categories are different, but the accounting is similar. The numbers are summarized in Table 3, which shows total outlays in California of about $8.6 billion, and revenues of $12.4 billion. MS: Do you mean that highways are generating a surplus of nearly $4 billion on an investment of $8.6 billion in California alone? Highways look like a good business. AK: Not really. 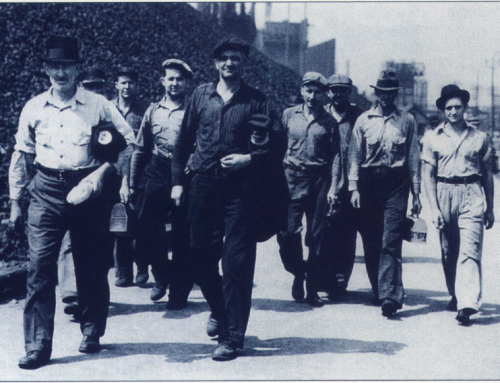 The highway system looks like good business only because of the unrecovered social costs. If we add these, the balance sheet turns upside down. Using the numbers in Table 1, we estimated social costs for California at $4.57 billion, which wipes out the surplus generated by the system and leaves us with the balance shown in Figure 2. The deficit is $800 million. MS: And to recover these costs? 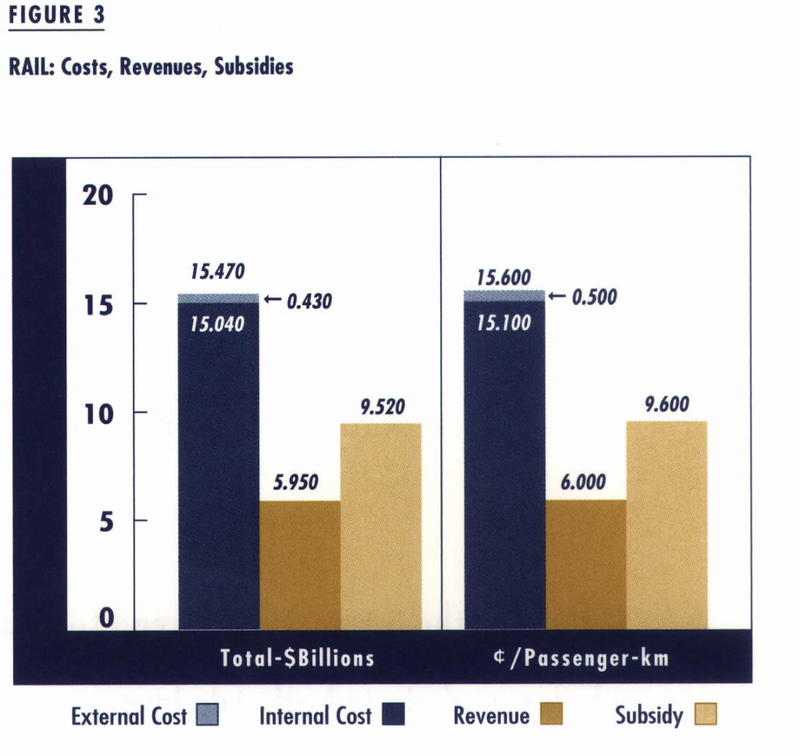 AK: It shouldn’t be difficult to recover this implied subsidy, because it totals to only 0.12¢ per passenger-km. At prevailing auto occupancies and vehicle mileage this subsidy can be recovered with a mere 4¢ per gallon additional gas tax. Such a surcharge wouldn’t have a significant impact on demand for auto trips. I don’t think a $2.25 surcharge on air tickets and a 4¢ gas tax surcharge would deter people from these two modes in the California Corridor. MS: But suppose your estimates of social costs are too low. What if we double your numbers? Could air and highways still recover their costs with manageable surcharges? AK: If we double the estimated social costs, then the gas tax surcharge would jump to about 35¢ per gallon. The airline ticket surcharge would jump to about $5 per trip. It’s clear that the highway figures are more sensitive, because social costs represent a higher proportion of the total for highway than for air. MS: But such surcharges might alter demand. AK: Probably by diverting more highway traffic to air, which in itself will reduce social costs of the overall system! MS: Hmm! Now what can you say about high-speed rail? Can it pay for itself with a manageable and competitive fee and tax structure? What subsidies do you estimate for a California TGV? AK: Here we had to do a different accounting, because we don’t have an existing system to furnish empirical data. We used estimates of capital and operating costs for a system linking the California Corridor that were prepared by the California High-Speed Rail Commission. Commission studies also estimate market share and consider the revenue potential of the system. Current estimates foresee a very-high-speed train, running at over 300 kph, connecting the Corridor from Sacramento to San Diego, and generating about 20 million passenger-trips and about 10 billion passenger-kilometers annually by the year 2015. We converted the Commission’s estimates to the following equivalent annual costs in 1993 dollars: $595 million in revenues, and $1.5 billion in costs, of which $43 million are in external costs. This is shown in Figure 3. MS: These numbers are quite dramatic. This is a deficit of nearly $900 million, not too much higher than the highway system deficit of $800 million. Surely we can recover these from fares, just as you suggest for air and highways. 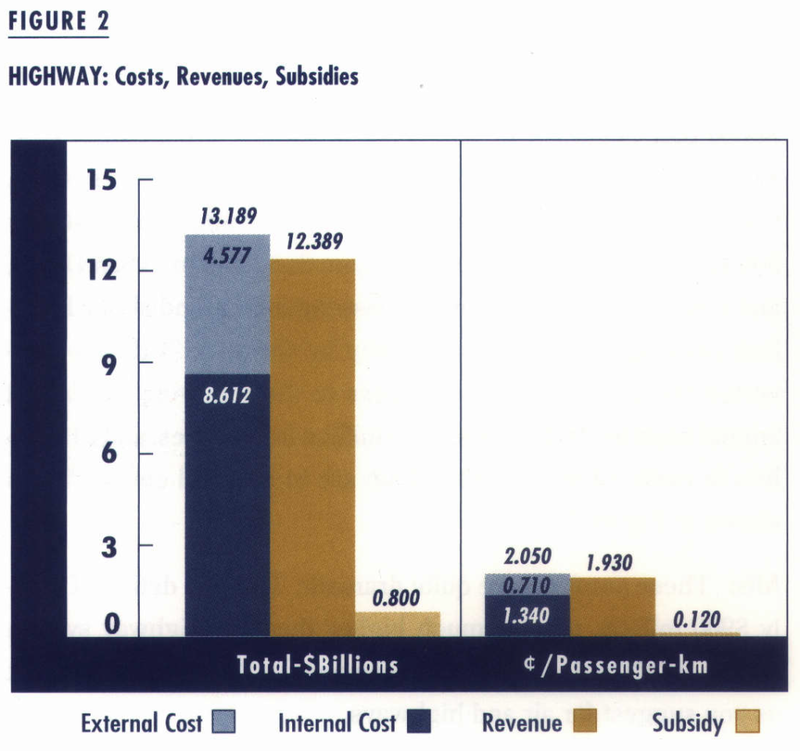 AK: But this deficit amounts to 9¢ per passenger-km. To balance the books and recover this would mean a fare surcharge on a SF-LA trip of about $45. Compare this to the $2.25 surcharge on air fares. Such a large fare surcharge most likely will seriously affect rail ridership. Current estimates are based on rail fares that are maintained at 30 percent less than average air fares, resulting in a market share for HSR of about 50 percent. These estimates are already rather optimistic. Recall that Commission studies estimate nearly 20 million annual HSR trips in 2015, which is about the same as rail traffic in the whole of the Northeast corridor today. It’s therefore quite unlikely that an equilibrium can be found with such a large surcharge and that the books can be balanced without subsidy. MS: Are there other possible sources of revenue? AK: Yes, we can count on revenues generated at HSR stations. We estimated $777 million in local airport revenue. About half is from aeronautical charges such as landing fees. The other half is commercial revenue from concessions and parking. It’s fair to assume that HSR stations will have a similar revenue-generating potential. MS: That’s a fairly good assumption. Would it avoid a subsidy? AK: Assuming a revenue potential of $350 million annually, the deficit would drop by about a third; and so too would the subsidy. The necessary ticket surcharge would drop to $28, still too high to maintain both the market share and sufficient rail traffic to generate these commercial revenues at rail stations. MS: It may be easier to balance the books for highways and air, but sometimes we use subsidies as instruments of policy or as means of mitigating social costs, such as environment impacts or traffic accidents. Suppose people value air quality much more than current estimates of social costs suggest? AK: Based on our sensitivity analyses we found that even with a ten-fold increase in the value of environmental quality, the deficit for high-speed rail would still be twice that for air and highways. Are people willing to pay such high surcharges to balance the books? And if they’re not, should the state do it for them through taxation? MS: Perhaps we should build more highway and air transportation facilities, since they generate surplus relatively easily. AK: What would you do with the surpluses generated? MS: Finance the high-speed rail system, of course! According to your tables, an additional 3¢ of highway gas tax would cover the deficit of the rail system. You estimate 4¢ of gas taxes to cover the highway system. If we charge only the 3¢ needed to finance the rail system we would still be subsidizing highway users by 1¢ for each passenger-km. This seems a good deal to me. I mean you must consider all the advantages of rail which your financial analysis ignores. Consider the local accessibility and the economic development effects of a rail line going down the California Corridor. Consider the jobs created by building the rails and all the trains that have to run on them for decades to come. I wanted to remind my flight companion that she was overlooking air transportation in this comparison. But we’d just landed in San Francisco and, perhaps fortunately, I had no opportunity to comment further, other than to agree that the subject deserves further discussion. 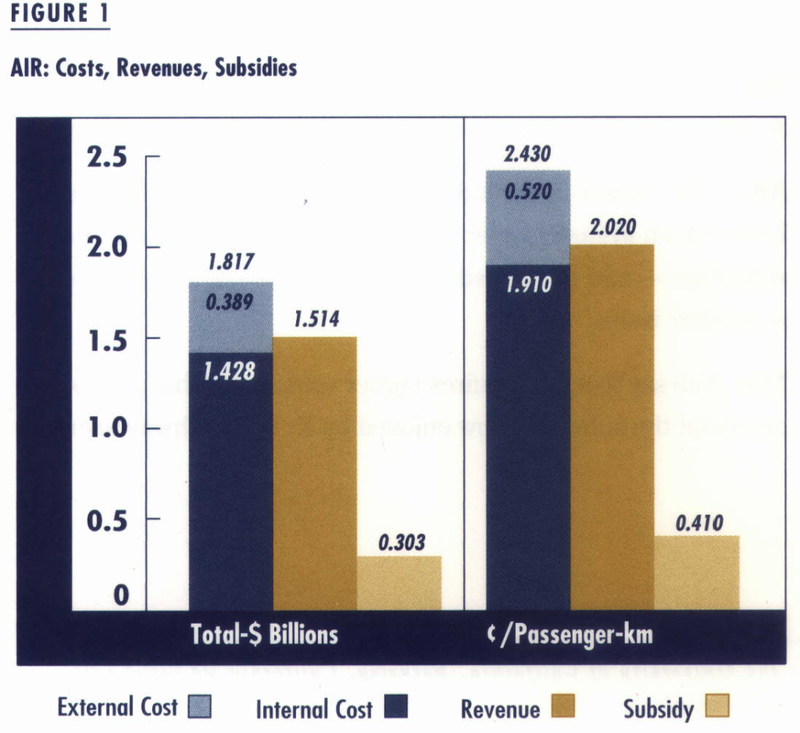 Benefits of Different Transport Modes, Report of the Ninety-Third Round Table on Transport Economics, Lyons, June 30 – July 1, 1992 (Paris: European Conference of Ministers of Transport, 1994). 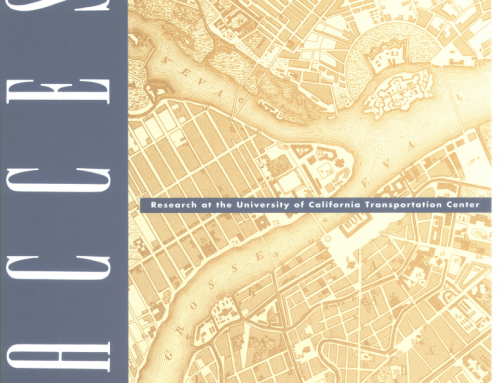 Greene, David L ., Donald W. Jones, and Mark A . Delucchi, The Full Costs and Benefits of Transportation (New York: Springer, 1997). High-Speed Rail Summary Report and Action Plan, Intercity High-Speed Rail Commission, Sacramento, California, December 1 996. Internalizing the Social Costs of Transport (Paris: European Conference of Ministers of Transport, 1994). 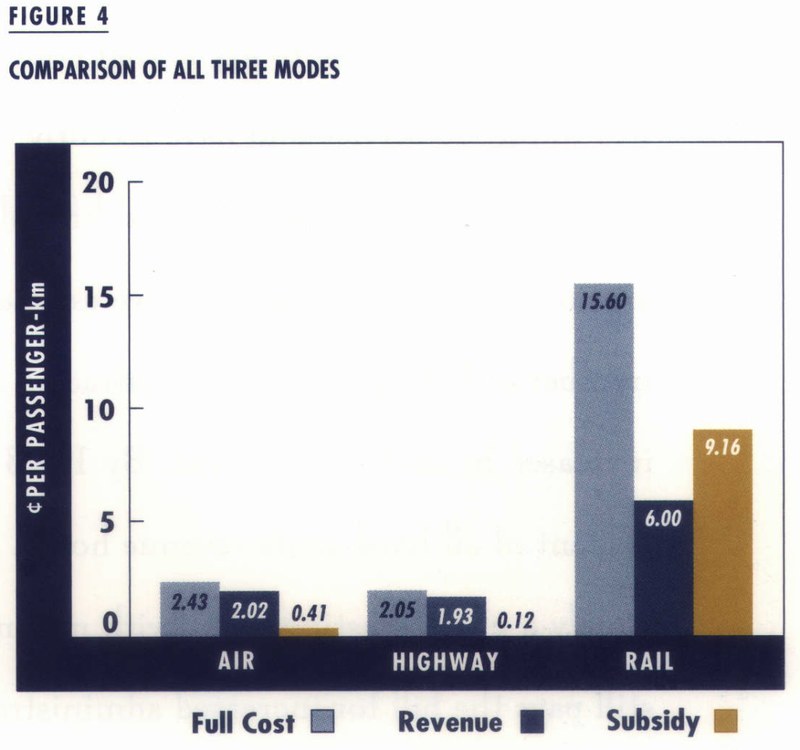 Levinson, David, “The Full Cost of Intercity Travel: A Comparison of Air, Highway, and High-Speed Rail,” ACCESS No. 9, fall 1996. Adib Kanafani is Cahill Professor of Civil Engineering in the Department of Civil and Environmental Engineering at the University of California, Berkeley (kanafani@berkeley.edu).